There is an apparent trend showing social media platforms are shifting more towards ‘authentic; usage of the platforms that encourage community building, and we’re seeing more features and changes coming as a result. Staying on track with these changes will be important for the long-term success of your campaigns. Twitter has shut down API access to a number of third-party apps and ended support for Twitter for Apple Watch and Twitter for Mac. This includes popular tools like Tweetbot, which are not officially run by the social media site. Official mobile apps and those run by Twitter, like TweetDeck and Periscope, are still fully functional and will remain so. Twitter has made a lot of changes this year in order to try to reduce clutter and make room for more meaningful engagement. We saw this with their restrictions on automated or cross-promoted retweets, and this is just another step down that path. If you’re using any software to enhance your Twitter marketing with features like scheduling or content creation, keep an eye on your profile to make sure things are working as expected. If not, you’ll need to cut the app loose and see if you can find Twitter-run alternatives, like TweetDeck. LinkedIn groups have been around for a while, but they’re now being relaunched. According to TechCrunch, LinkedIn will be adding groups to their main app. They’ll also be focused on reducing spam and making the groups more efficient. They’re doing this with temporary removal of features like sending posts as emails to the entire group. LinkedIn groups have always had enormous potential but fell a little short. They become too self-promotional, but with new developments, that could change. If groups pick up on LinkedIn, this could be a great asset for hotels and resorts. You can network with and learn from other industry experts, find potential employees, and even occasionally mention your conference or lodging services to professionals looking to make bookings. Group admins can now link Facebook’s tracking pixel to their group, allowing admins to better track user growth and engagement on their actual websites off-platform. This information will be anonymous, and it will only be available to groups that have at least 250 members. Facebook Groups are a powerful community-building tool, but the ability to anonymously track group member’s relationship to your hotel or resort as a whole outside of the actual group is a huge advantage. Now you can more accurately assess whether the group is driving more leads or bookings, or building stronger relationships with your guests. 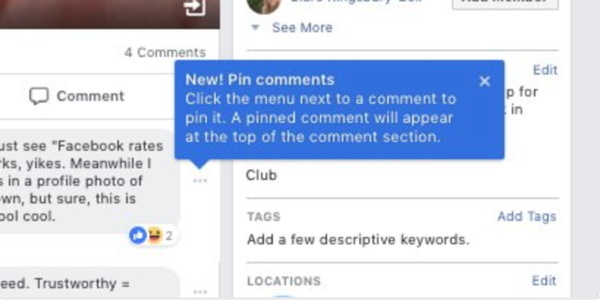 Matt Navarra found a feature Facebook is testing that will allow group admins to pin comments in discussion threads. This will push that comment to the top of the comments section in the conversation thread, ensuring that it’s the first thing people see. If you have groups for your hotel or resort, you have likely already seen how conversations can spiral amongst members. People veer off course with the discussion, or you (or someone else) ends up clarifying the same thing many times over. The ability to pin comments will give you additional moderation control so that you can keep things on track and hopefully framing the group and your hotel in a positive light. Subscribe Now – It’s Free & Never Miss an Issue.